Basic idea: A culture defines itself through its images. A culture expresses itself in its architecture, symbols, and works of art. The debate surrounding the construction of a Holocaust Memorial in Berlin raged at the beginning of the project in 1998. I noticed that this debate circled around itself. Truly new perspectives weren’t even offered the opportunity to be noticed. Through my therapeutic education, I learned that the actual question is concerned with how to deal with a trauma, rather than just finding the right type of architecture. The project to construct a monument for peace and positive responsibility coming into life for our country, and the philosophy of another way of commemorating with life at its focus, was presented to the public in 1999 in the book “Circle of Peace - A Turning Point” [Friedensmal Wendepunkt] (Jahn & Ernst Verlag). It was further disseminated through press articles and far more than 1,000 mailings to information multipliers, and above all through this website, which dates back to 1998. 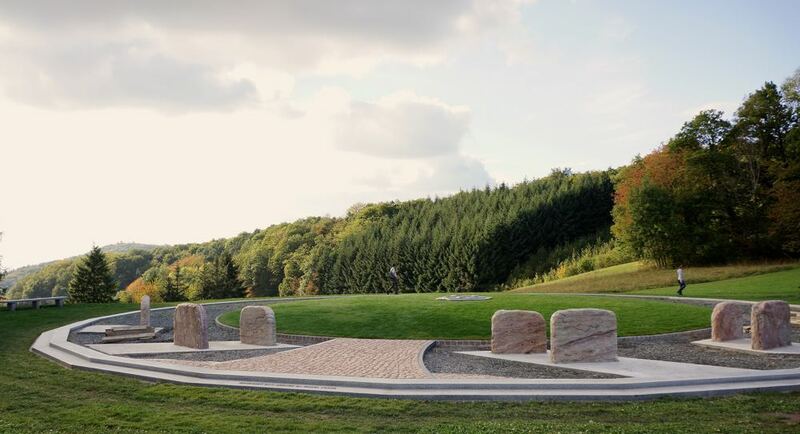 The name “Circle of Peace", a new type of a monument of peace, starts to establish itself in addition to the in Germany well-known category of a Mahnmal (admonishing memorials to remind us on the atrocities against the dignity of man). A Circle of Peace should be dynamic in representing a process: from an admonishing position in the commemorative culture towards a desire for peace. It speaks of the transformation “from dust to light” (the philosophy of Nelly Sachs). In 2001, the association was founded that managed to collect the financial means necessary to realize the project over many years. In 2004, I had the honor of a private audience with the Dalai Lama, to whom I could introduce my vision. This made quite an impression back home, which helped to get the necessary approvals. In 2006, the land for the project was bought. The Hessian Prime Minister Roland Koch speaks out in a personal letter for the realization of the private project. In 2008, the Catholic Deacon Thomas Groß, who oversees this region, supported the project during his New Year’s speech. I always considered it important that this project would be understood and accepted as a religiously connecting project, without striving to blur the differences between the different religions. In 2010, the association starts construction of the Circle of Peace. It seemed that the conditions were created that it could be understood and accepted. It is difficult to raise awareness for something new without the right connections to the establishment. However, new ideas can only come from outside of these circles of established people, there’s no other way. This should encourage everyone else who has a new idea that is yet to be truly accepted. Please take a look at the section Development in the main menu to learn more about the development of the project. In today’s fast-paced day and age, the development period of this project will be seen as rather lengthy. Taking into account, however, that this project represents a paradigm shift, the few years that have passed seem like quite a short time. Please also take some time to read through my thoughts, which took years to develop, write down, and then materialize as a Site for peace and freedom. The causes can be found in the realm of ideas, in our thoughts. We then encounter the effects in the world around us. Real change must be effected in the realm of ideas. The way we think is with words and images. We are limited in our thinking to the words and images which are available to our mind to use. We have to work on the words and images (also of "architectural images" like monuments). This way the idea expresses itself.